Welcome to our beautifully appointed three-room suite on the main floor of this lovingly restored, owner occupied, 1880’s “Queen Anne” home. Although we are located very near to the lively downtown Asheville area, the large lot is surrounded by trees and lush vegetation which affords a great deal of privacy and the feeling that you are “away from it all”. As an added attraction, some beautiful black bears enjoy meandering through my yard, and though I can't guarantee that you will see them, a sighting is a distinct possibility. We are located at the base of Town Mountain, just a short walk to downtown as well as neighborhood restaurants, coffee houses, shopping and entertainment. There are fireplaces in each of the rooms, yes, even the bathroom which also features a large glass shower and fluffy towels. The bedroom has a queen size bed with fresh linens. Just off the living/dining area there’s a “mini” kitchen complete with bar sink, under-counter refrigerator, microwave, toaster oven and a Keurig beverage maker. You can have your morning coffee or unwind at the end of the day sitting on your private deck adjacent to the bedroom. Whether you are visiting us for business or pleasure, when you come home to relax, you will be able to access your Netflix and other accounts on the 40” Sony Bravia smart TV. There’s also a Blu-ray DVD player for your convenience, and of course there’s free wi-fi. You may park your vehicle just outside one of the two private entrances, and although we don’t leave the light on for you, a welcoming light comes on if you drive in after dark. I grew up in a small town near Nashville, Tennessee where I met the incredible young woman who would later become my wife. After graduating college, I enlisted in the US Air Force and served in the four years, during which I was stationed in Mississippi, Turkey and Texas. Most of my corporate life was spent in Houston, TX. Since moving to North Carolina, I have enjoyed buying and restoring old properties, running a bed and breakfast for a while, and flipping properties. International travel is a favorite thing for me to do, so I get away as often as possible. However, most of my time is spent mentoring young men and facilitating a grief recovery program at my church. My wife and I moved to Asheville from Houston, TX in 1989. We restored a wonderful old house in the Chestnut Hills Historic district where we accomplished our dream of having a bed and breakfast. We lived and worked there until 2001. 115 Arlington Street is only a few blocks from the bed and breakfast that we started. We chose Asheville because the mountains offer a sense of peace and tranquility not found in many other places. Also, we were attracted here because of the fascinating mix of people who call Asheville home. Asheville has wonderful restaurants comparable to many of our favorites in Houston. Also to be found in Asheville are the Symphony, Asheville Community Theater, and outstanding medical facilities. We were drawn here by the Blue Ridge Parkway, The Biltmore Estate, The Folk Art Center and the like. I have appreciated such things as a huge farmers market for fresh produce, and alsoexcellent shopping for groceries in our local stores. I love the natural beauty of the area and sometimes enjoy taking a picnic lunch to a sunny rock in the middle of a rushing stream on a warm day in February. Asheville is very simply a great place to vacation and live. When we moved from our bed and breakfast down on Chestnut Street, the things that attracted me to this property were, and still are: it's close proximity to downtown--its an easy walk which I do often; the charm of a wonderful 1880's home; the privacy afforded by the lush greenery around the lot; and the beautiful view of the mountains. toilet, shower, Beautiful. Large glass shower, fireplace. Fireplaces in the living room, bedroom and bathroom. Each with electric logs. Dishes, flatware, glasses, coffee mugs, Disposable items available in kitchen drawer. 40" Sony Bravia "Smart" TV allows you to sign in to your account on Netflix and other entertainment sources. Charge your mobile device or stream your own music through the clock/speaker. There's one located in the living room and another located in the bedroom. You can have your morning coffee or unwind at the end of the day while enjoying a view of the western mountains from your private deck adjacent to the bedroom. We loved our stay at Gene’s place! A true gentleman who looked after every detail-from the plate of fresh baked cookies waiting upon arrival, to bagels and cheese, bottled water, and juice waiting for breakfast. This is a very comfortable apartment minutes from downtown, and a great place to relax and enjoy! 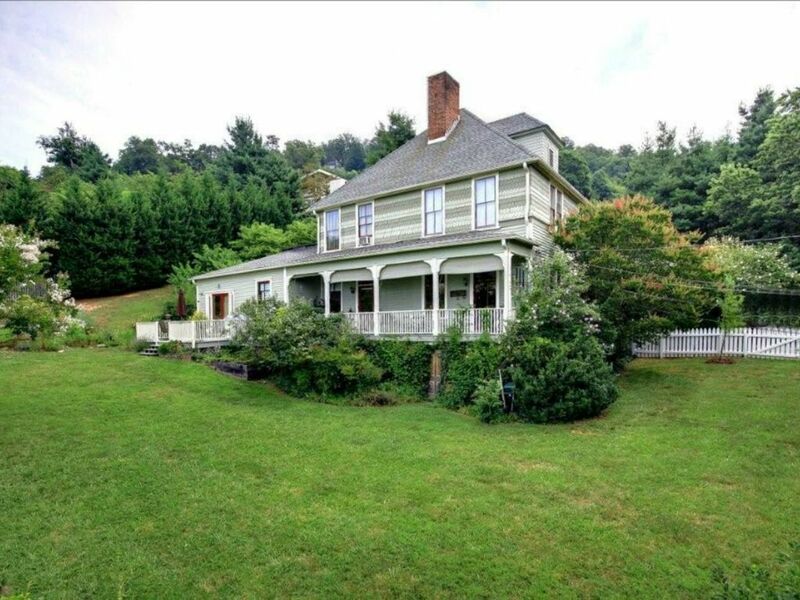 Gene is a wonderfully professional host and the property is perfect for an Ashville getaway! We could not have been more pleased with our stay at this beautiful little place in Asheville. Quiet, secluded neighborhood; 10 minutes to downtown and Biltmore. Our host was more than gracious, he made us feel like we were home. We will stay here again on our next trip to the area. Overall this suite was outstanding! It was just the place that my wife and I were looking for to celebrate our anniversary. You can’t beat the location, which is within walking distance of many downtown amenities. Gene Dugger takes a lot of pride to ensure the customer has a wonderful experience. The property is clean, cute and cozy (per my wife). Gene has lived in the area for several years and will give you great advice on restaurants and local venues. If there’s one con about the experience, big if, it would be the mattress on our bed. My wife and I are used to a firm mattress and this one is more on the soft/springy side. Other than that, I would highly recommended this property. Thank you Gene! Very nice apartment like section of home, in convenient area for access to Asheville. Homeowner Gene is very nice and helpful, but never intrusive. Highly recommended! Our host Gene made us feel welcome and at home during our stay. Suite is very comfortable, spacious, and very private. Downtown area is close, we took Uber rides to dinner to avoid parking challenges. Restaurants were excellent with lots of choices. We made the right choice to stay here, much more comfortable than a hotel. Definitely recommend this place to stay, can’t say enough good things about the overall experience, especially for our first time visiting Asheville!